I've written before about how much I love Spanish food, and all the amazing things that there are to eat here. Unfortunately, one area where– in my opinion– the Spanish are lacking is their puddings. Having lived in Lyon for five months, where puddings and pastries and chocolates and all those lovely little things are such an art and so great in number, I can't help but feel like there isn't much in España that competes. 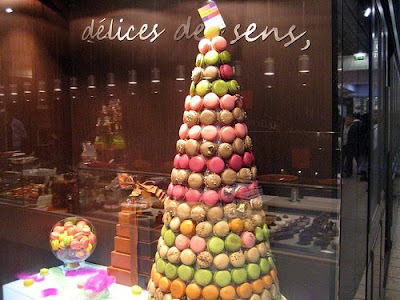 A tower of macarons in Les Halles de Lyon. Delicious bastards. I miss being 2 minutes away from a pâtisserie at any one time, and all treats that I could get so easily and so cheaply. And so do my flatmates, apparently; two of whom, like me, spent the first half of this school year in France. Lia had been asking me for a while if we can figure out how to do a tarte au citron, apparently her favourite confection (I'm much more of a tarte aux fraises gal m'self). I loved the idea of making this, but was... intimidated. The idea of making pastry frightens– or, I should say, frightened– me a little, mainly I think because with pastry there's so much that could go wrong. I thought (for a hot minute) about buying a ready-made pastry from the supermarket and using that, but if it was going to be worth doing, it was going to be done from scratch. To get help conquering my fear I went to a site that I trust very much. I started reading David Lebovitz's blog when I was in Lyon, which seems a little odd seeing as I was without any means of cooking, but as it happens David Lebovitz is not only a great chef and food writer, but his 'American in Paris' perspective was so helpful when it came to just living in France, never mind eating there. And, he had some great tips on where to go and what to do in Lyon as well. So, I went started searching for pastry recipes, and sure enough I found one. One that made me totally more confident about the whole tart endeavour. It's a little... unconventional, but it works so well and the pastry comes out beautifully flaky, just as you'd find in a little French pâtisserie. My very first ever pastry shell. Not half bad, I'd say. Anyway, here is what we got, and while I'd say it was not perfect (I had to make do with what I had in my kitchen, no mesh strainer, no fluted tart pan) it was one heck of a good start. The curd that I made was also from David Lebovitz's site, but I modified it slightly to yield a bit more and to be a bit more lemon-y. I like it that way. And of course now that I'm not so afraid of the pastry, I'll make it prettier next time. Promise. 1. Preheat the oven to 350º F/180º C/ Gas mark 4. In a medium-sized saucepan, heat the lemon juice, zest, sugar and butter together, waiting for the butter to melt. In a small bowl, beat together the eggs and egg yolks and set aside. 2. Once the butter has melted, whisk in roughly a third of the mixture to the eggs. Make sure to mix constantly: this will warm the eggs up a bit. Put the egg mixture back into the saucepan. Cook on a low heat, stirring the mixture until it thickens and there are bubbles starting to form around the edge of the saucepan. 3. Pour the curd mixture through a strainer onto the tart shell. Using the strainer is important: it gets rid of all the little lemon pips and thick nasty bits that may have made their way into your mix. If it needs help getting through the fine mesh, stir it with a spoon or spatula. Use a spatula to smooth over the top of the tart. 4. Put it in the oven for 5 minutes so that it has a chance to set. Remove from the oven. Leave to cool before slicing and eating. Damn you and your delicious pudding-making skills. You've made me incredibly hungry - might have to actually go and buy something yummy to munch on! This looks soooo yummy, wish I'd got to try some! HHuuummmm!!! Les bons macarons! J'ai moi aussi succombé à la tentation macaron en écrivant sur mon blog!